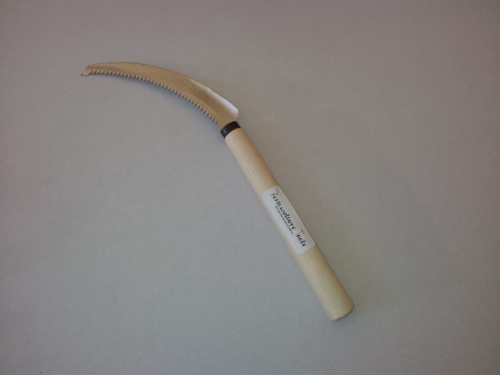 The Premium Hand Made Large Sickle is a life-time tool, (if correctly cared for, following care instructions). After every use, the Premium Hand Made Large Sickle blade should be wiped clean and sprayed with a permanent lubricant i.e. INOX not WD40 or RP7 (non-permanent lubricants). 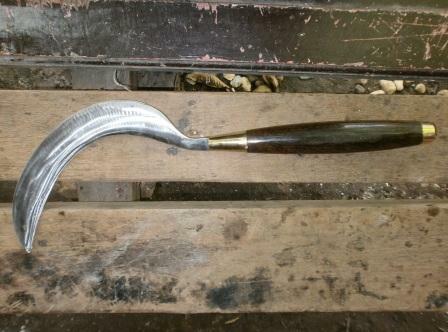 The Premium Hand Made Large Sickle blade should be sharpened with a sharpening stone and water, not a file or grinder and must be oiled after sharpening. 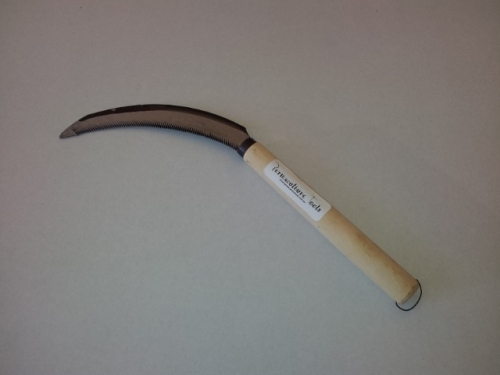 Due to the nature of the Premium Hand Made Large Sickle being hand-made, there will be slight variations in the size, shape and colour of the tools and materials used. The vision about Permaculture Tools came about 15 years ago, at The Permaculture Research Institute working with old style hand tools from around the world. Many people would ask where they could buy one of these or one of those and the answer was always “the country they came from” or “good luck finding one of these old tools in a garage sale”. This is where the vision came from; wanting to supply fellow permaculture practitioners with good quality hand tools that where easy to access without having to go to some obscure country to buy them. 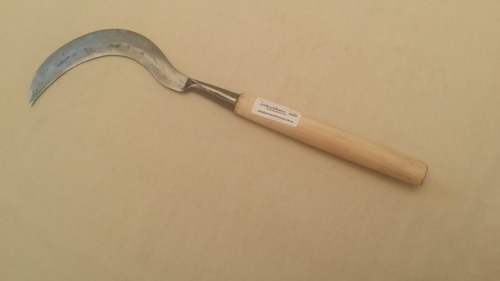 When working last year at Zaytuna Farm, home of the Permaculture Research Institute of Australia, was fortunate enough to be gifted a Rice Knife( a Premium Hand Made Serrated Sickle to be exact…) by Danial Lawton long standing Permaculturalist and the man behind Permaculture Tools. 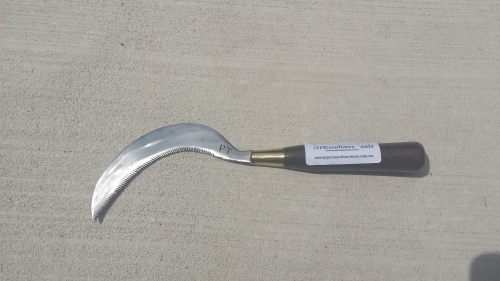 Prior to that I had only used the more common Rice Knives available, and while they certainly do the trick my new Serrated Sickle was a definitive step up. So much so that at first I was reluctant to even use it and thought it best be placed on the mantle as an ornamental! But I soon got over that and have since used it in a of climates and scenarios, from subtropical northern New South Wales to cool temperate New Zealand to arid northern Morocco to mediteranean south west Australia. In all the cases it’s proved itself a superlative tool for removing grasses and herbaceous growth from tight spots and especially around the sensitive collar of trees. By following the care instructions offered by Danial on his website I’m confident this tool should last me for decades to come….